We’re a peanut butter household. I like crunchy, my husband prefers smooth, and our toddler doesn’t seem to mind either provided he gets “nut butter” in some form. I’ve never enjoyed the dry texture or mild taste of Black Cat although I’ve heard it’s the healthier option for those keen on less sugar or fat. But after recently trying samples, I was impressed by a new product Oh Mega peanut butter. A company called Crede Oils sent the smooth and crunchy versions. So far the Oh Mega crunchy has been outselling smooth by almost two to one. Impressions? It’s not as sweet as other peanut butters, and the paste tends to separate, but that’s easily rectified if you stir it before spreading. The crunchy butter contains large, uneven bits of nuts, which I liked. 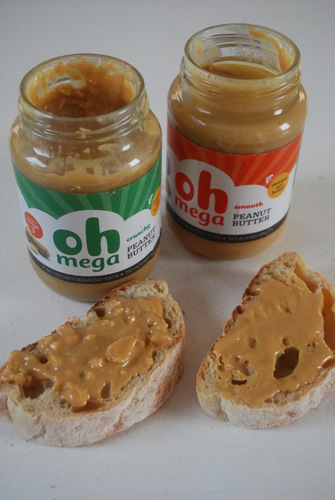 According to Crede Oils, Oh Mega was a response to most available peanut butters in South Africa being “healthy but bland in taste, or quite unhealthy and loaded with sugar, salt and hydrogenated fats”. Oh Mega peanut butter contains no hydrogenated fats. Other plus points: Peanuts contain about 25% protein and are rich in nutrients including folate, magnesium, fiber, vitamin e and B3. This peanut butter is manufactured from flaxseed oil, rich in omega 3. It’s sweetened naturally with honey, which has anti-bacterial properties. The oil separation is partly countered by the addition of pasteurized egg white powder, a natural source of protein commonly used in commercial baked products. Do remember that as flax oil cannot be heated, Oh Mega peanut butter should not be used in baking. Oh Mega peanut butter is available from health shops and at Spar, retailing for around R30. I’ll certainly search it out.